Meditation: "I invite my children to realize the profound depth and perfection that comprises my beloved Son’s heart. Allow yourselves to be drawn into this vessel of perfect love, mercy and truth. Let the flame of His heart consume you and bring you to the heights of union with the Holy Trinity. To Him all honor and glory!" "Jesus, bestow on my children a hunger for salvation through devotion to Your Most Sacred Heart." Our Father, who art in Heaven, hallowed be Thy name. Thy Kingdom come, Thy will be done on Earth as it is in Heaven. Give us this day our daily bread and forgive us our trespasses as we forgive those who trespass against us. And lead us not into temptation but deliver us from evil. Amen. Meditation: "Immaculate Heart of Mary, You are the purest vessel of grace, the definition of holiness, and a sign of the apocalypse. Mary, Your heart is a refuge of holy love - a counter sign in an evil age." "Dear Heart of Mary, it has been ordained that the conversion and peace of the world be entrusted to You. Only through holy love can the battle be won. As You, Heart of Mary, have been pierced by many swords, impale our hearts with the flaming arrow of holy love." 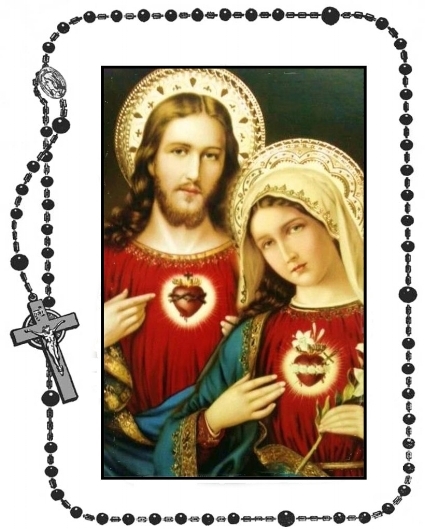 "Immaculate Heart of Mary, pray for us." Meditation: "Jesus was willingly to be put to death for the sins of mankind. He died for each one and for all. From His side flows, yet today, an unending font of love and mercy. Do not be reluctant, as Simon was reluctant, to embrace the crosses you are given. Many suffer the eternal flames of hell, for no one has been willing to suffer for them." "Eternal Victim, truly present in the tabernacles of the world, pray for us." Meditation: "As my Son suffered for you, I suffered as well, in my intellect, in my heart, and in my body. My physical cross remained hidden. My emotional and intellectual crosses could only be guessed at – the intensity burning within me. So too, should your suffering remain hidden, whenever possible, to gain merit for souls, grace for the world." Meditation: "I invite you to understand that your ‘yes’ in the present moment to holy love is atoning to our united hearts. I tell you this, my little one, for to live in holy love in every moment requires heroic self-discipline and surrender to God’s divine will through holy love." "You can sacrifice many great things - possessions, events, and more - but none so great as your own will. This is the greatest atonement." O united hearts of Jesus and Mary, Thou art all grace, all mercy, all love. Let my heart be joined to Thine, so that my every need is present in Thine united hearts. Most especially, shed Thy grace upon this particular need (state need here). Help me to recognize and accept Thy loving will in my life. Amen.